January 3, 2001--Jake went to UNC for some research type testing to be done with his implant on.They did and electrical ABR and reflex testing and got exactly what they wanted...WAVES on the ABR and electrically elicited MEMR! They said that they got really good information from him (Initial results from post-operative, electrically-evoked ABR’s using the cochlear implant electrodes as stimulus show positive ABR’s on apical, middle, and basal stimulation. Furthermore, electrically-evoked acoustic reflexes were observed in the ear contralateral to the implant.) Unbelievably, he behaved for the entire time. Whew! 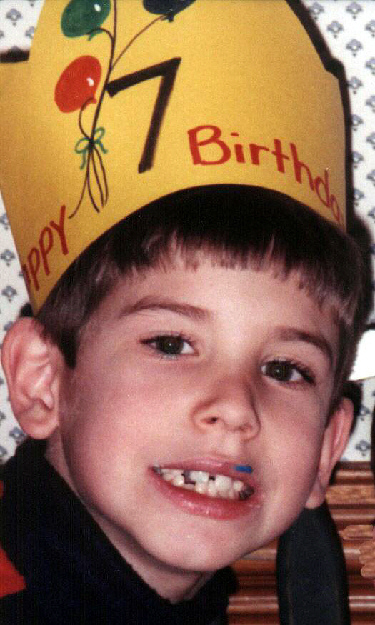 January 10, 2001--Today was Jake's birthday. He is so proud to be 7 years old! But, for me it was a little sad because he is the oldest child in the class and I fear that when he is older that he will be picked on because of that. He really doesn't know he is different from the other children, but one day he will realize when the bullies pick on him. It's too bad you can't protect them from all the mean things that will be said to him in the future. January 16, 2001--Jake asked me today, "Mommy, what happened to Papaw (when) him died and go heaven?" "Why him go leave Lulu, Jake, Mommy, Daddy, and Josh?" Broke my heart and is really weird because today is the anniversary of his death. Something I haven't mentioned around him. January 22, 2001--While in the library for reading circle today, Jake answered a question about the book they were reading! Everyone was very excited with that breakthrough in participation. He is still doing Fast ForWord and doing pretty good. We also started a reading program called Reading Milestones with him and he reads the entire first book every night and then does the homework sheets that go with it. He got his report card for the first semester and made Satisfactory on all goals except for Is Attentive and Listens Carefully which he got Needs to Improve because he is a wiggle worm and daydreams sometimes. The teacher commented that he shows a great improvement in his ability to interact with his classmates and teachers. He is beginning to respond to specific questions at group time and relaying his ideas to very simple sentences. At this time, Jake still knows more than he communicates to me and that they would continue to give him opportunities to develop self confidence in talking to them. They also commented that he is identifying the basic concepts of print and showing interest in beginning to read independently. January 30, 2001--We have worked on irregular plurals for what seems like months, but is really just a few weeks. Tonight in speech homework, he told us that it is "one goose, three geese" and even got mouse/mice, deer/deer on his own! February 2001--It is hard to believe that Jake just had his two year evaluation for the implant! His speech production scores were awesome. The only errors he had was leaving the N off the end of balloon and problems with the R. He scored 100% on almost every test with his lowest score being 89% on consonant place and manner because of the R and N issues. He made 44% and 80% on the PBK this time, but was not totally cooperative so we think he probably would have done better if he had been cooperative. He would actually point at the wrong picture on purpose for several objects that we knew he knew. March 12, 2001--I spoke at the RI conference on Auditory Neuropathy and I don't think there was a dry eye in the house after hearing Jake's twisted story with AN. I know I lost it a few times and if it hadn't been for Dr. Berlin holding my hand part of the time I would have never made it. As I spoke, I found out that some of the old wounds that I thought were healed, obviously weren't. I think I did okay even though I was scared half to death. I also got a standing ovation! I wish Jake could have been there so that everyone could see firsthand how well he is doing. March 21, 2001--I went back to work this week and Jake is not taking it well at all because I have been driving him to school forever and this week I am not able to take him. He acted out at school and cried to his teacher that he missed his Mommy. He was also crying and said he missed me while I was in RI for the conference. I wonder if he is too attached to me. He has never slept over at a friends house because we were never comfortable with the communications issues he had if anything happened. His teacher says he is spoiled, hmmmmm, maybe he is, just a little bit! March 26, 2001--We are currently working on oral-motor exercises to help Jake produce the R sound with his tongue in the right place. Somehow, he learned to make the R sound by dropping his jaw down to the right side and not by tongue placement. It is alot of work and he really doesn't like it, but he does like the strawberry and grape flavored tongue blades that we use to practice! We are also quite distressed because we found out today that my husband has to have open heart surgery to repair his aortic valve. Both boys got very upset when they heard us talking and Jake said, "Daddy is going to heaven, going to hospital and heaven." Hopefully, we can get him to understand that all people in the hospital don't die. 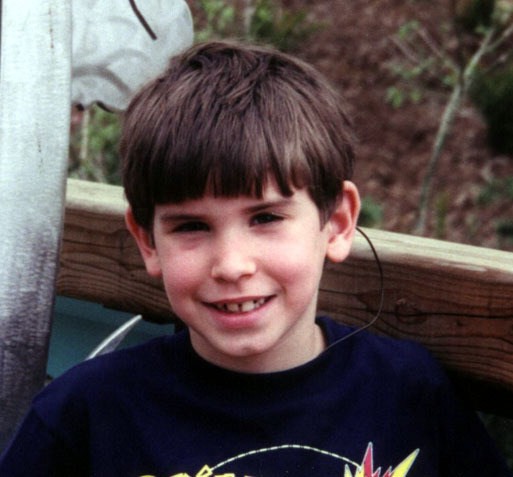 April 3, 2001--We have been concentrating on regular past tense verbs and opposites lately and Jake is making great progress according to his speech therapist. He has now decided that he wants to be a firefighter and a NASCAR driver when he grows up! I am an RN in a rehabilitation unit that has different levels of care in other areas of the facility. I take Jake to visit the residents and try to get him to start talking more to people. Finally, he talked to several of them today!! I usually take his puppy so that he has a reason to talk; like telling them his name and such. Anyway, there was one lady that was talking to me very loudly and I was talking right into her ear. On the way home, Jake asked me why the lady was screaming at me when she talked. I told him that she was deaf like Jake and that is why she was loud. He said "Mommy, she needs an implant!" I just thought that was so cute! April 12,2001--We had to cancel our camping trip for spring break because of his Dad's heart problem. We were able to take a day trip to the zoo here in NC. Jake had a great time and learned lots of new words and animal names while we were there. He really enjoyed himself but ran me up and down those hills all day! April 18, 2001--We are now working on the voice on TH sound and he is doing really well with it in the initial position. We went to the zoo on spring break and Jake loved seeing all the animals. The break is over, and he was glad to see Miss Overcash again. She is his teacher of the deaf that he is with about two hours a day and he absolutely loves her. So much that he tells me that he is telling Overcash on me when I scold him because he is HER baby! He is a rotten little boy. He is the leader in his class for the reading goal of 150 books for the year with 221 books that either I read to him or he read himself! I have noticed that he is really trying to sound out unfamiliar words now since the Fast ForWord program was completed. He will have his post language testing soon to see how much progress he makes. April 24, 2001--Jake told me the tonight that he knew why Daddy's heart had to be fixed. This is so sweet so you may need a tissue! He said, "Mommy, I know why Daddy's heart is so sick." I asked him why and he replied, "Daddy has a BIG heart, big with a lot of love and it got too big and broke.....so now he needs it fixed!" April 25, 2001--Jake got in trouble for talking back tonight and after I punished him he told me that I had a "little tiny heart, not like Daddy's big heart of love".......haha, talk about a manipulator! Then he said a prayer at the supper table that I couldn't understand all the words to but was something to the effect of..."Papaw in heaven, Daddy's heart is sick, him go to hospital, not want him to go to heaven too." I almost started crying right there. He is very worried about Dad's surgery because everyone he can remember going to the hospital died. Now he thinks that if you go there you are so sick you will die. He was also asking some good Wh questions tonight spontaneously. Like he asked me, "What is a stomach," and when I explained it he asked, "where is my stomach?" I showed him and he said, "Oh, it's my tummy Mom!" April 26, 2001--I had an end-of-year teacher conference today and Jake was with me. We had been talking about how well he hears and understands with his implant and how much more "hearing" he has than the other implant kids we know. At the very end I whispered something to the teachers that I didn't want him to hear, because I said a naughty word (oops). He was a good 5 feet away from us and all the sudden I have this tap, tap, tap on my shoulder saying "Ooooohhhhhh, Mommy, I heard that" We all looked shocked and he just grinned and said "I told you, I heard what you said." Is that cool or what? He has also been saying alot of words that are slang like gimme, and whatcha doing? I know that this is partly due to the cueing but I don't cue at home so he is picking it up through audition alone, among some other words that his brother said that I don't approve of! He has also started adding, "Right Dad?" or "Right Mom? "to the end of sentences just like his brother does. This drives my husband and I absolutely nuts with one kid doing it.....not we have two of them. April 30, 2001--Jake's Dad had surgery on his heart today. We had a bit of a scare when I went to visit about 6PM and I think he may have heard the conversations around the house and panicked. He has been very scared, but when I called home tonight to tell the boys goodnight, he got on the phone and was begging and pleading for me to "Please come home Mommy, please, please come now." It was so sad because he wouldn't be quiet long enough to hear me say I was on my way after visiting hours. Well, when I got home tonight my Mom said that she had a big scare while I was gone. Seems that Jake shut down even with her trying to tell him that I was coming home after I checked on his Dad. He hid under the table for a while and then when she said it was bedtime he rebelled and ran out the door and down the middle of the street at 9PM! For him to run off in the dark he was really upset. I think he realized that he was alone outside in the dark and couldn't see our house and decided to come back to his Grandma. Scared her half to death though. It broke my heart to know that he is that scared of this whole situation. May 15, 2001--Jake has been very clingy lately and wanting to sleep in his implant. Last night he started crying when I tried to take it and I asked him if he liked it. I was shocked because he said "NO!" I asked him if he liked being able to hear and he said, Yes, but no implant." I kept telling him that he was deaf and there was nothing we could do to help him hear except wearing the implant. I encouraged him to tell me why he said that he didn't want the implant to hear. He got very angry and screamed at me "I DON'T LIKE DEAF! I WANT TO HEAR", and burst out crying with those huge crocodile tears running down his face. I was so upset wondering if someone had said mean things to him at school and wound up crying myself to sleep. It breaks my heart because I would do absolutely anything if it could make his hearing magically appear...even if it meant I had to be deaf. Sometimes, no matter how well he is doing with the implant, I become very angry that my precious son has to be deaf. He is just an innocent child and doesn't deserve all the difficult times he has faced already and will face in the future because he is deaf. May 30, 2001--Today was the last day of school! Jake is going to first grade and he made satisfactory on all areas of his report card. He also won the reading award for his class! Exciting stuff! He is reading at the level he should be for leaving Kindergarten. He still has difficulty retelling a story, but I think it is a self confidence issue personally. It has been a busy month with end of year evaluations and testing. Jake doesn't test on paper to have a huge gain in language after Fast ForWord, but we see a huge difference in him by observation. We filled out the questionnaires to assess for ADHD but he only scored a bit high in impulsivity again. It amazes me because he is having a hard time sitting still in circle time and can't keep his hands to himself. June 2001--Another busy month, practicing sounding out words and listening games. I went to New Orleans to be on a parents panel at an audiology conference and met another little girl with AN. Jake is still a busy little bee, talking up a storm. He is into the "repeat everything that brother says" phase and is driving poor Josh nuts. But, he is learning new words and repeating sentences correctly, so it isn't all bad. July 6, 2001-- We went to Rochester, MN for the second AN parents conference. Jake met another little boy with AN named Levi and they really hit it off. It was amazing that he signs and Jake is oral/CS but they had no problems getting their needs and wants across to each other. Jake loved taking pictures and playing in the pool with his new friend. They got along great and are both little stinkers as far as I can tell! 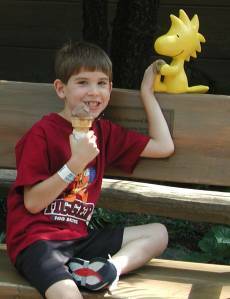 We went to Camp Snoopy on family day and Jake rode his first roller coaster. He didn't like it either, but he liked the big chocolate ice cream cones! July 8, 2001--Jake was having cortical testing today at Mayo Clinic to see how his brain is reacting to hearing through the implant. I had bribed him that I would give him ten dollars if he completed the test. He had started to squirm around and I said, "Jake, do you want the ten dollars." He sat there a minute and said, "Mom, I need a twenty." Everyone thought that was very funny! July 21, 2001--Jake, Dad and Josh went to the UNC cochlear implant picnic today and the TV news station came to increase awareness of the implant. Jake was playing ball and is the child that they filmed for the six o'clock news! He got his thirty seconds of fame. He was very excited to be on TV. Mom was happy and cried to see her baby son become a star! July 27,2001--We all went to Myrtle Beach for the week to get some rest and relaxation before school starts again. Jake was so funny when he saw the beach. He yelled out, "Oh man, look at that BIG swimming pool!" He kept asking me where was the other end of it because he could only see the sky way far off. We all had a really good time and found lots of shark teeth and shells. After three days he was asking to go back to his house though. He really doesn't like being away from home at all. Everytime I got on to him for something he would say, "Please Mommy, don't worry, okay." Little brat! 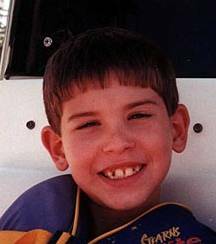 August 7, 2001--Audiological appointment at UNC for Jakes 2.5 year evals! It is hard to believe it has been that long since he got the implant. His audiogram was at 20dB at 250, 500, 750, 1500 & 6000Hz, 25dB at 1000, 2000 & 4000Hz and 30dB at 3000Hz. His SAT was 0dB, and I didn't hear it! They remapped him and decreased his T & M levels slightly on different channels because he was hearing better than they want CI kids to hear and they think that there may be too much background noise where he was. He also had OAE's done on his right ear today at my request, just out of curiosity since he hasn't worn a hearing aid except for one day the last 10 weeks. His regular hearing aid is broken, and the waterproof one drowned somewhere on the way to Rochester ;-) The OAE's were totally absent now---- no response in any frequency. Before they were considered absent but he had one frequency that had a small response in that ear. He got 100% on the ESP and had the same old errors with L and R in certain positions when he got in a hurry on the Paden Brown test. So we continue to work to get a consistent yeLLow instead on yeyyow and a Leaf instead of neaf. He missed tree and said twee, which was strange because tree was one of the first consonant blends he said right after he got the implant. I am not too worried though, I understand that it is only slightly below age appropriate speech production. He was a perfect angel and we zipped right through the audiogram, testing and most of the mapping. I was very proud of him for his behavior at the audiologist appointment and hope that the first day of school this coming Monday goes well too. August 10, 2001--Jake met his mainstream teacher today and actually spoke to her, so that is a good start. He seems very excited to go back to school Monday and has been asking when he could go back for over a week now. August 13, 2001--My baby is grown! He marched right into the classroom without clinging to me when I tried to leave. He sat at his table and told me to "leave now Mommy!" I almost cried that he didn't need me anymore and didn't cling to me. August 15, 2001--We took a few days off from school and went to meet my good online friend Orla and her son. Jake, Josh and Orla's son had a great time and it was cool for the kids to meet another child with an implant. Jake didn't like the idea of going in the "big swimming pool" again after seeing the guy catch two baby sharks in Myrtle Beach. I told him there were no sharks where we were at but he said, "Yes, I saw baby sharks in the big swimming pool and they have big Mommy sharks." Pretty smart! Jake and Orla's son got along well and had no trouble communicating. August 31, 2001--Jake is loving school, reading up a storm and sounding out words easily. He loves to read now! At school, he hesitates to go sit down in class some days but once I leave he is fine. I think he is playing Mommy's emotions. His teacher said he is fine when his Dad brings him to school. What do you think? September 7, 2001--Jake had his first spelling test today and made 100% on it! I was worried that he wouldn't hear the teacher well enough to get the words since they all rhymed, but he did. He isn't watching the transliterator either! September 30, 2001--Jake has been busy at school, working hard and playing just as hard. We felt that he was too clingy and sullen many days that I walked him into the building, so we started letting him walk in by himself this month. He wasn't too keen on it for a few days, but finally took to it and hops right out at carpool and goes to class. No problems with his mood and behavior first thing in the morning since then. So, I guess that my baby is now a BIG first grader. October 17, 2001--WOW! We had a teacher conference today and Jake's is at or ABOVE grade level in all academic areas!!!!!!! He did some math that some other kids couldn't do! He does have difficulty with what they call "Mental Math", but they say that with practice he will be able to do the math orally. His only problem is in reading comprehension where we feel he is a little behind, but is improving daily! However, he is still a little unsure of himself and afraid to make a mistake so we struggle to get him to answer the teacher when she asks him comprehension questions. She said that she knows he can talk because he talks to his friends at the table when he is supposed to be quiet! He also talked up a storm to her and me at the conference and she told him that he really needed to talk to her and the other kids more. He promised us he would because he wants to go to second grade! He does tell me things that they did and read at school so I know he has to be comprehending something to be making the progress he has. It is hard to believe that last October, he couldn't read anything much except family first names and such simple things like that. He has worked very hard to get where he is now and I am so PROUD of him. WOW, I can't believe he has caught up in almost everything!!!!!!!! Jake is making good progress in all academic areas. He is a developing reader, reading at the 11-12 level and is building a sight vocabulary of functional words. He is using word attack skills on new text with less teacher support. He is beginning to read beginning to read loud enough to be heard in small and large group settings in the classroom. This shows that he is gaining confidence in himself as a reader. We are observing him using more consistency in using capitals, punctuation, and spacing appropriately on written work. Jake seems to be more confident as a writer, often writing three or four sentences on a topic. He is using resources available in the classroom like the desk dictionary, word wall, and vocabulary around class to help him in using words correctly Jake has mastered all first grade math skills for the first semester. November 30, 2001--Jake had another good month at school. He is so smart, but struggles with grammar at times. He has a hard time with little words like to, and, it, the, etc. at times. He will leave words out and say, "I want go shopping Walmart," instead of "I want to go shopping at Walmart." I know he gets sick of hearing me correct him so I try to say something like "Is that what you are supposed to say? Did you leave something out?" Or I repeat what he said with the correct words added with some emphasis. His TOD sends a weekly progress report home for us to see what he did with her everyday so we have a good idea what is happening. He got his new hearing aid and wears it to school but takes it off as soon as he gets in the car.